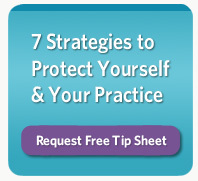 You’re a health care provider, healer, or caregiver. You’ve dedicated your career to caring for others. It’s not just a job, it's part of your identity. But now you wonder why you no longer feel compassion for your patients, or you dread going to work. Perhaps you made a mistake at work and a patient suffered harm. Or you watched a colleague make a mistake or witnessed an unanticipated outcome that ended tragically. You want to talk to someone but don’t want to burden or scare your family. And you feel too much shame to discuss it with co-workers. You re-live the experience repeatedly, can’t concentrate, and are terrified of another mistake. You fear a lawsuit. Or maybe the patient’s already sued and the letter from your licensing board just arrived announcing its investigation, while you’re still overwhelmed by the investigation going on at work. You’re afraid that you’ll lose your license—and your ability to earn a living. I can help. For over 25 years, I have successfully defended every one of my licensure defense clients, obtaining either a dismissal without discipline, or a negotiated agreement for a specific result. If you already have an attorney for your malpractice lawsuit or your licensure matter, I can help by coaching you through the experience and helping you not only learn to master stress, but find in the challenge the opportunities for growth, learning, and yes—even healing. I bring my heart AND mind to the art of practice—whether providing legal, coaching or consulting services—to help you keep your license and your sense of well-being. Good News for Minnesota Nurses and Patients! I am happy to report that the Minnesota legislature recently passed Senate Bill 511, which means that as of January 1, 2015 Minnesota Advanced Practice Registered Nurses (APRNs) will be able to practice autonomously, without the mandatory physician collaboration agreement previously required under the nurse practice act. Under the new law, advanced practice nurses are eligible for separate APRN licensure, the requirements of which are set forth in the new MN 148.211. Subd.1a. In addition to the requisite education and certification, APRNs must also have a current RN license. The Minnesota Board of Nursing is busy creating the necessary infrastructure to implement the new law and expects applications for the new licenses to be available sometime this fall. The new law also directs the Board of Nursing to convene an Advanced Practice Nursing Advisory Council to provide recommendations and advice to the Board, and review prescribing trends and practice patterns (148.2841). Here are some of the other highpoints of the new law. • The definition of APRN, as well as a description of APRN certifying body requirements are in the amended 148.171 Subd 3. The definition of APRN practice is in newly amended 148.171 Subd. 13. • The official license designation is now APRN, followed by the appropriate practice designation, as follows. There are also accompanying amendments to the definitions of those four types of practice. o psychiatric and mental health. • In order to qualify for licensure, new nurse practitioners and clinical nurse specialists must still complete 2080 hours of “postgraduate practice” within the context of a collaborative agreement and setting, but that collaborative agreement can be with a physician or APRN (148.211 Subd.1c). • Newly amended 148.235 Subd 7a outlines the independent prescriptive authority of APRNs. The former restrictive language that required a written prescribing agreement with a physician was repealed. • And finally, last but certainly not least, the new law grandfathers into practice those APRNs who are licensed to practice as of July 1, 2014 but unable to meet the educational requirements of the new statute (148.211 Subd. 1b). If you have questions, need more information, or want specific advice about the new law, give me a call! Posted by Katherine J Pohlman. In case you did not see the excellent March 10, 2014 Star Tribune commentary penned by my nurse attorney colleague Eileen Weber, I am posting it here in its entirety. It's a must-read for anyone concerned about future access to healthcare and the role advanced practice RNs. You can contact Eileen at weber058@umn.edu. now for a free consultation.